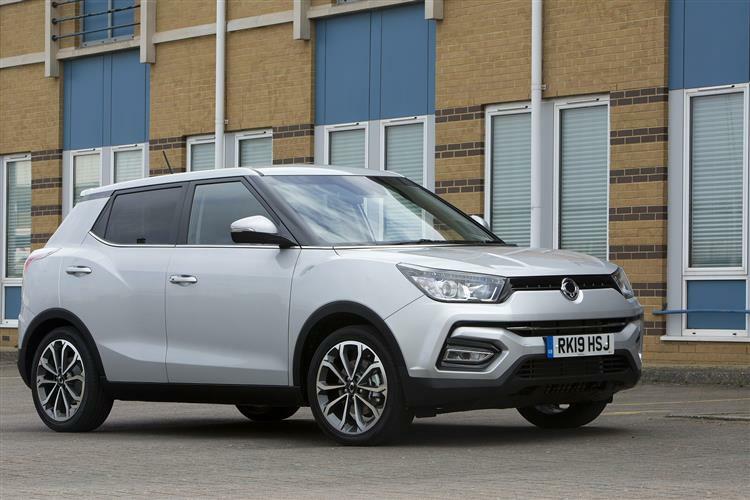 The SsangYong Tivoli takes the fight to small SUVs like the Nissan Juke and the Renault Captur with budget pricing, a gutsy range of engines and build quality the like of which you wouldn't credit at this price point. 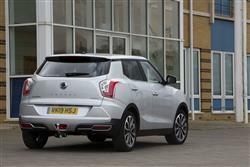 It's proved to be SsangYong's breakthrough model. SsangYong's has a problem. It doesn't sell enough cars. Last year its Korean compatriots, Kia and Hyundai, shifted more vehicles in the UK alone than SsangYong does around the entire world. For a car company that competes in the budget sector, moving small volumes is fatal. Even with the financial backing of Indian giant Mahindra and Mahindra, SsangYong knew it had to do something and fast. It had no real experience of building cars in the classes that make the massive numbers, so the Ford Fiesta, the Volkswagen Golf and the rest of their ilk were safe from assault. But what if it could turn its experience in building cost-effective all-wheel drive vehicles to the rapidly-growing crossover sector? Surely it could give cars like the Nissan Juke, the Skoda Yeti and the Renault Captur something to chew on? That's the logic behind this Tivoli. The Koreans certainly haven't done things by halves here. This is no cut-down Korando chassis with a bunch of ancient carry-over engines. The Tivoli has had some serious investment thrown at it, and it shows. The chassis is all-new, albeit hardly adventurous in its suspension design, with MacPherson struts up front and a space-efficient torsion beam rear end. There's a choice of two 1.6-litre engines, a 128PS petrol unit and a 115PS diesel and both of them drive only through the front wheels in our market. Through the corners, body control is decent and the steering consistent, if a little light. Fortunately, you can weight it up by playing with the 'Smart steering' system that SsangYong has decided all models should have, a set-up delivering three self-explanatory modes - 'Normal', 'Comfort' and 'Sport'. The 1.6 petrol unit will get to 62mph in a relatively relaxed 12 seconds and is offered as standard with a six-speed manual gearbox. Pay a little more and you can pair this engine with a six-speed automatic, which is the same unit as seen in the latest MINI, albeit with a bit less sportiness built into the shift logic. This auto gearbox is obviously well suited for the city - and smoother than the rather jerky belt-driven CVT auto set-up you'd find in an automatic Nissan Juke. Move through its cogs though and you'll find long ratios chosen for economy rather than speed. The Tivoli is one of those cars that the longer you look at it, the more design influences you can see. There's something of the Kia Soul in its overall proportioning, with a Nissan Juke-like rear haunch, a front end that's modern Renault in a good way, some Citroen DS3 about the rear three quarter and an interior that's glitzy in an upper-model Vauxhall way. 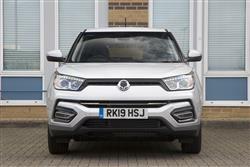 There's nothing about this car that says SsangYong and, to many, that will be a good thing. Perhaps the Koreans need to work a bit at developing their own family look. 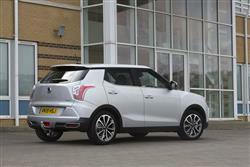 It's not there yet, but the Tivoli is by no stretch of the imagination a bad looking car. Nor indeed is it a cheap looking one. The detailing such as the floating effect roof, the satin roof rails and the materials quality of the interior are at least as good as, if not better than, many of its mainstream rivals. This revised model gets a re-styled rear bumper with chrome inserts. The cabin certainly feels as if it's been the recipient of better quality dash panels and seats than, say, a Nissan Juke. 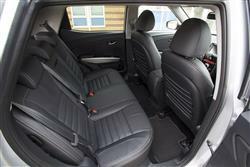 The boot measures 423-litres to the parcel shelf, which is perfectly adequate in this class. If that's not enough, there's also an XLV model with a much larger 720-litre cargo area. Prices start at around £14,500 for the base model most will choose - or from around £20,000 for the XLV version. Looking at the standard variant, this means a Tivoli can easily undercut a rival Nissan Juke, which starts at around £15,200 - and it's much better equipped. Do remember though if you're making that comparison that you're not really comparing like with like, the Nissan getting a 95PS engine, fully 30PS down on the SsangYong's petrol powerplant. Even stepping up to the next engine up in the Juke range, the 1.2 with 115PS, doesn't bring power equality with the Tivoli, and Nissan wants over £17,000 for the cheapest one of these. Suddenly you begin to see why SsangYong are so bullish about making huge gains in sales. There are 'SE', 'EX', 'ELX' and 'Ultimate' trim levels. Go for flagship trim and you'll find that both petrol and diesel variants will be offered with the option of automatic transmisssion for an extra £1,000. As for equipment, well all Tivoli versions get 16" alloy wheels, cruise control, a stop/go system (on the petrol version), Smart steering (with normal, comfort and sport modes), an RDS/Bluetooth radio and seven airbags. The running cost returns of this car are better than you might expect. The 39.2mpg combined cycle figure for the 1.6-litre petrol-powered manual car is about the same as you'd get from a rival TCe 130 Renault Captur. The petrol model's CO2 figure is rated at 166g/km in manual form and 171g/km in auto guise. 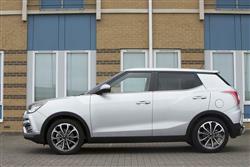 The diesel Tivoli delivers 56.5mpg on the combined cycle and 130g/km of CO2 in manual form. Or 47.9mpg and 155g/km of CO2 as an auto. A bigger concern might well be residual value. SsangYongs have lost a lot of the benefit of their low upfront purchase price through depreciation, but that may gradually be changing. The latest Korando is stacking up better than older models from the marque and this 'gentrifying' effect on the brand could well continue with the agreeably slick Tivoli. Do you love it? The 'Tivoli' name, in case you hadn't realised, spells 'I lov it' backwards. Or, if you prefer, connects his car into the elegance of the Roman hilltop town that was home to the Emperor Hadrian. 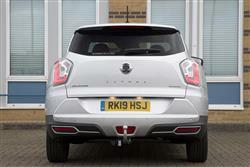 Either way, it's a badge appropriate for the kind of fashionable little Juke-genre Crossover this car is trying to be. Does this over-stuffed market sector really need yet another option? If it's inexpensive, better equipped and more spacious than the norm, then we'd say yes. There may be more dynamic, more efficient choices in this segment but can they really offer enough to justify their higher pricing? Are the products in question really that much better than this one? Try a Tivoli and you may well decide not.